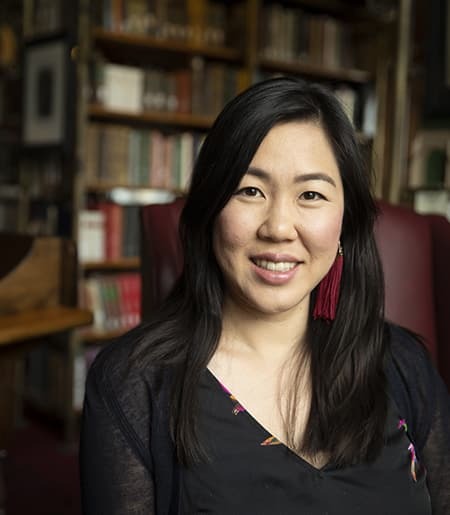 Julia Chang is Assistant Professor of Spanish in the Department of Romance Studies, a member of the core faculty in Feminist, Gender, and Sexuality Studies, and affiliated faculty in the Southeast Asia Program. She holds a PhD in Hispanic Language and Literatures with a Designated Emphasis in Women, Gender, and Sexuality from the University of California, Berkeley. She has also taught at Brown University and San Quentin State Prison. Her areas of specialization include nineteenth-century Spanish literature and culture with a special focus on the realist novel, gender studies, and medical hygiene. More recently, she has begun research on Hispano-Filipino relations and late Spanish imperialism. Professor Chang’s current book project, Blood and Chastity: Narratives of Purity in Spanish Realism, examines the fictional afterlife of limpieza de sangre (blood purity) by examining realism’s fallen women—caught in a bind between modern gender ideals and the persistence of blood-based social hierarchies. She also has two new research projects. The first examines the racialized and gendered contours of Hispano-Filipino relations after the opening of the Suez Canal in 1869. The second theorizes the concept of utility in relation to military masculinity in the aftermath of American emancipation and Spanish colonial defeat. "Becoming Useless: Masculinity, Able-Bodiedness, and Empire in Nineteenth-Century Spain,” Unsettling Colonialism: Transoceanic Perspectives on Gender and Race in the Nineteenth-century Hispanic World, Eds. Akiko Tsuchiya and N. Michelle Murray, SUNY UP, forthcoming October 2019. “Bella y Varonil’: Looking Back at Mauricia in Benito Pérez Galdós's Fortunata y Jacinta,” Special Issue: Freakish Encounters: Constructions of the Freak in Hispanic Cultures. Eds. Sara Muñoz-Muriana and Analola Santana. Hispanic Issues Online 20 (2018): 156–174. “Between Intimacy and Enmity: Spain and the Philippines Post-Suez,” Journal of Spanish Cultural Studies 17.4 (2016): 305-322. “Blood, Purity, and Pleasure in Leopoldo Alas’s La Regenta,” Hispanic Review 84.3 (2016): 299-321. “‘Aquellos neófitos indios, chinos o anamitas:’ Asia and the Imperial Imaginary in Doña Luz,” Arizona Journal of Hispanic Cultural Studies, 18. Arizona Journal of Hispanic Cultural Studies 18.1 (2014): 235-246. “Tiempo loco: Queer Temporality in Emilia Pardo Bazán’s La Tribuna,” Revista de Estudios Hispánicos 48.3 (2014): 549-569.